We were puzzling over Jesus's initial response to the father. “You unbelieving and perverse generation how long shall I stay with you? How long shall I put up with you?" Rather than being moved by compassion Jesus seems upset and irritated. But why? And with whom? Though Jesus is talking with the father it doesn't seem that Jesus is irritated with him and his request to heal his son. 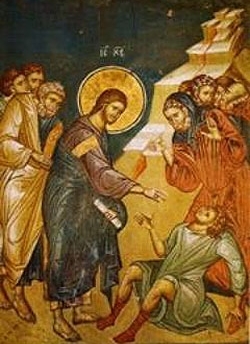 Maybe Jesus is irritated by his disciples who had failed to cast out the demon, perhaps because they lacked faith (see verses 19-21). What I argued out at the prison was that we should take the target of Jesus's rebuke at face value. Jesus doesn't rebuke the father or the disciples. Jesus rebukes the generation. It seems, to me at least, that Jesus is blaming the suffering of this child on the perversity of the generation. Jesus is angry because the wickedness of a generation is causing children to suffer--physically, psychologically and spiritually. And I think Jesus's rebuke still rings out. Children continue to suffer in our world because we are an unbelieving and perverse generation.